This stylish and cosmopolitan archipelago, the Cyclades is the most famous island group in the Aegean Sea, comprised with some of the most beautiful islands in the world. Golden sandy beaches, architecture in white and blue, traditional lifestyle and music, crystal azure waters, welcoming people, sterile sceneries with remote chapels, turn a journey to the Cyclades into a lifetime experience. This group of 24 inhabited islands (and 220 total isles) is located in the central part of the Aegean Sea and have a Mediterranean climate, with mild and moderately rainy winters, and warm and sunny summers. The name “Cyclades” was coined in the Archaic period as the islands form an approximate circle (kyklos) around the central and most sacred island (at that time) of Delos. According to the Greek mythology, Poseidon, God of the sea, furious at the Cyclades nymphs turned them into islands. Islands of the Cyclades: Amorgos, Anafi, Andros, Antiparos, Delos, Ios, Kea, Kimolos, Kythnos, Milos, Mykonos, Naxos, Paros, Santorini, Serifos, Sikinos, Sifnos, Syros, Tinos, Folegandros, Donousa, Irakleia, Koufonisia and Schinousa. 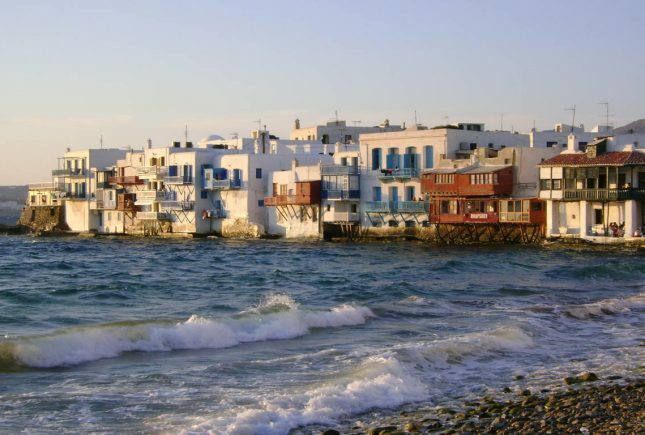 Mykonos is a wonderful combination of simple traditional life and a glamorous jet set lifestyle. By the 1950s the island was already ‘the’ fashionable destination of celebrities, including many distinguished movie stars, singers, politicians and royals. Its legendary parties have become some of the hottest events of the year. Tale has it that the rocks have a unique energy capable of soothing the soul and lightening the mood the minute you set foot on the island. Mykonos is well known for its amazing sandy beaches, the vivid nightlife, the white country chapels and the Cycladic architecture. Santorini is one of the world’s most beautiful islands, a true wonder of nature and probably the only volcano in the world with its caldera in the sea. Resembling an open-air natural history museum, this extraordinary island and its four neighboring islets were formed by one of the biggest volcanic eruptions in recorded history, in the late 17th century B.C. With its dazzling panoramas, romantic sunsets and volcanic-sand beaches, Santorini continues to amaze with its surreal beauty. The whitewashed villages, blue-domed churches, sandy beaches, fishing harbours overlooked by taverna tables, plus lively bars and cafés, make Paros one of the best holiday destinations in Greece. Boasting a relaxing vibe, with great beaches and a plethora of welcoming hotels, Naxos is an ideal island for holidays with the family. For the island lover, the Lesser Cyclades, aka Donousa, Heraklia, Koufonisia, and Schinousa is paradise regained. Syros is the capital of Cyclades and rules the heart of the Aegean with its sophisticated elegance and its alluring mix of the medieval with the Cycladic architecture. The original hippie island, Ios, embodies that classic Greek island ambiance, while Tinos and Andros are full of adventure, activities, and epicurean delights. Milos, with its famous extraordinary rock formations, amazing shores and picturesque little villages, is the ideal romantic retreat. For those who wish to explore an alternate setting of mountains, valleys and exotic beaches, or enjoy privacy and relaxation, Folegandros is the ideal escape destination. Feel the divine relief of Amorgos with its religious memorials, and discover the secluded and magical beauties of Antiparos, Kimolos, Serifos and Sifnos. Untouched by the rapid change of modern development you will fall in love with the pureness of Anafi island and its Aegean sun and sea salt landscape, and you will be surprised by the warmness of the locals and their hospitality at Sikinos. Find tranquillity and simplicity and revive your body in the thermal springs of Kythnos and have a unique scuba diving experience at Kea, home to the shipwreck of the Britannic. Delos island is one of the most sacred places in Ancient Greece and a declared world heritage site from UNESCO, and a supreme archaeological treasure that is definitely worth exploring and is located next to Mykonos. Given the barren landscape of the Cycladic islands, their culinary culture has been described as frugal and simple. The Cycladic gastronomy infused with sea, scarce land, balance and Greek spirit, is an integral part of the cultural identity of Cyclades. Santorini wines may rank among the world’s best, but plenty more is offered in the region. Exceptional wines, quality beers, PDO liqueurs and rare distilled spirits make up the interesting proposals also coming from the other Cyclades. Unique products, from meat of limited production to fresh fish and seafood, dry tomatoes, potatoes, caper and high quality dairy products, divine dishes with limitless variations from island to island, are the main characteristics of every day diet and cooking found in Cyclades. Visit Delos, one of the most important archaeological sites of the eastern Mediterranean protected by UNESCO as one of the heritage sites of the world. Enjoy the magical sunset of Santorini, from Skaros in Imerovigli. The energy of the sun and the extraordinary colours will enchant you. 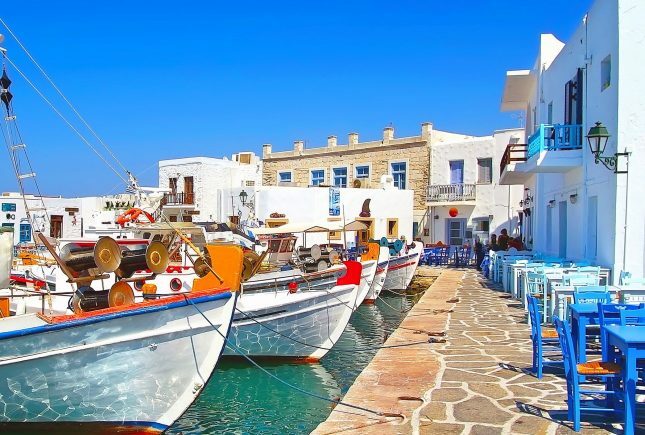 Walk the alleys of the traditional village “Lefkes” in Paros, and adore its amazing Cycladic architecture and neoclassical mansions beautifully placed on the hillside, facing the sea. 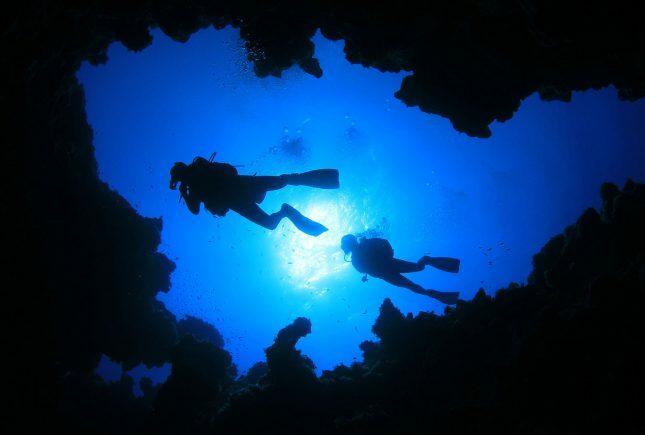 Pack your snorkeling equipment and go discover the nearby underwater caves in Mouros (or Mourou) beach, a stunning pebble beach in Amorgos, or enjoy a dip in the clear crystal waters. Walk, cycle or go donkey-riding all around the Anafi island, through the long trails and explore the old farmhouses with the extremely large oven, called “oven houses”, and the “mnemoria” the charnel houses. Take a sailing holiday around the serene gems of Cyclades. Start in Mykonos, and then leave behind the cosmopolitan lifestyle to go on your own Poseidon adventure, sailing to Santorini, Syros, Tinos Serifos, Sifnos.